LandTraveller from WolfCoder Workshop is a sweet 2D RPG that combines elements from traditional action-RPGs with sandbox building options and it continues to grow. Note: This game is currently in Early Access. Become a kemonomimi and thrive in this action RPG! See a constructive world from a new perspective. Customize, battle, and grow with deep action RPG elements. Play through a story or explore with friends. Search for lost knowledge and rare material to craft powerful equipment. Challenge the powerful enemies waiting for you deep inside the dungeons. Invite NPC citizens to join your cave or village. Discover your inner beast and realize your full potential! 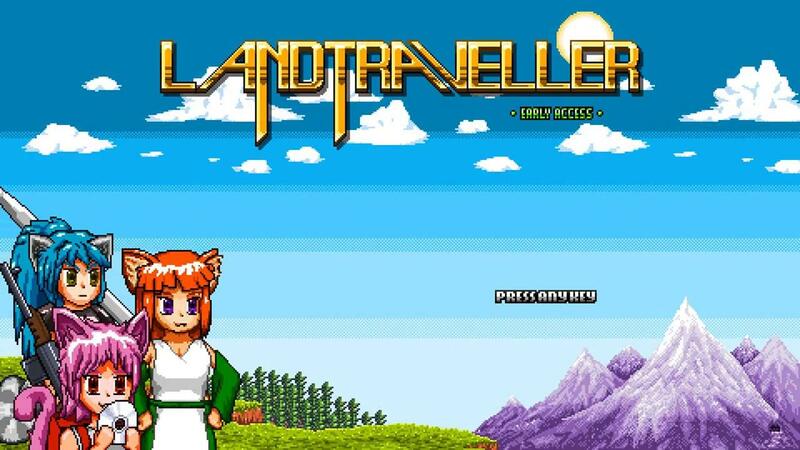 LandTraveller is a hybrid between a traditional action RPG and a modern indie sandbox combining interesting randomized environments with hand crafted world building. With different modes of play and online multiplayer, there's lots to explore. Earlier this month, the Chapter 3 update was released adding in a substantial amount of new content in the form of quests, a new area to explore, multiple new types of enemies to encounter, new items and so on. After not playing it in quite some time, I came back to take another look and came away even more impressed than I was before. It feels a lot more polished now, including it no longer crashing when going into fullscreen—hooray. The Linux version has been running very nicely now, good performance and no crashes at all for me. I tend to find these types of exploration RPGs a little addictive personally, time just seems to melt away as you explore, gather and craft. I'm a sucker for the progression system too, that has abilities level up the more you use them so I end up going off on long expeditions just to increase my skills and totally forget what quest I was supposed to be doing. If you enjoy games like Stardew Valley, you might find this to your liking too. A rather cute throwback to some of the earlier action RPGs in style, while still having plenty of modern elements. It can be played in both single-player and online with servers. Find LandTraveller on Steam. I've had this on my wishlist for a while, maybe I should pick it up sometime. It looks like the kind of thing I'd enjoy. I didn't pick up on the fact that this game has a multiplayer mode. Maybe I can convince the better half to try it with me.